Epoxy aggregate flooring is also known by a more descriptive name of exposed aggregate flooring. 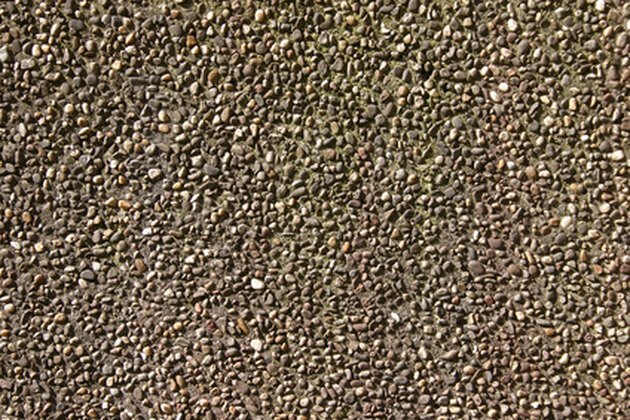 This flooring is constructed of concrete and epoxy, the top of which contains a layer of pebbles or rocks. The pebbles are pressed slightly into the concrete with the top surfaces exposed. The entire surface is coated with a layer of epoxy or other sealant, which makes the finish durable. Epoxy aggregate flooring is one of the simplest flooring types to care for. Aggregate flooring is easy to clean. Sweep the surface of the aggregate floor at least once per week using a broom or a vacuum. If the floor receives high levels of traffic, such as a work environment or a garage, sweep more frequently. Clean up spills with a cloth or a mop dampened with water. Use a floor cleaner if the stain is sticky. Steam clean the epoxy aggregate floor once per year to remove deep dirt and stains. Steam cleaners are available for rent at home improvement stores, although purchasing one is a good investment for aggregate floor owners. Fill the steamers with water and the type of cleaning solution recommended by the steamer manufacturer. Run the steam cleaner once over the entire surface of the floor and allow it to air dry.